The Romantic Road is one of the best tourist attractions in Germany. Actually, it is the "pearl" of all themed tourist routes in my country. From Würzburg in the north to Füssen in the south, the Romantische Straße brings travellers from the river Main to the stunning Alps. Discover wine-growing regions, lovely valleys, European history, culture and the most romantic sceneries. The Romantic Road starts in Bavaria, swings south-west into Baden-Württemberg for a while and goes back into Bavaria near Rothenburg ob der Tauber. The road is not the same highway (Bundesstrasse) from north to south, it is also not the shortest route between locations. You travel on minor roads rather than 4-lane highways. But hey, that means you can slow down and enjoy the scenery. No worries, you won't get lost. Just follow the big brown signs "Romantische Straße" that will tell you where to go. The scenic drive of approximately 413 km (257 miles) can be finished in one day, but hey, you would miss so much. Take your time, stop in a few towns for a night or two, and enjoy German hospitality. Picturesque towns, history and medieval castles wait to be explored. Religious art treasures and magnificent churches make the Romantic Road one of the best tourist attractions in Germany. Did I mention the fantastic local food? Bavarian, Frankonian and Swabian dishes like Maultaschen, Nürnberger Rostbratwurst, Pork Roast, Lentils and Spätzle are just delicious. 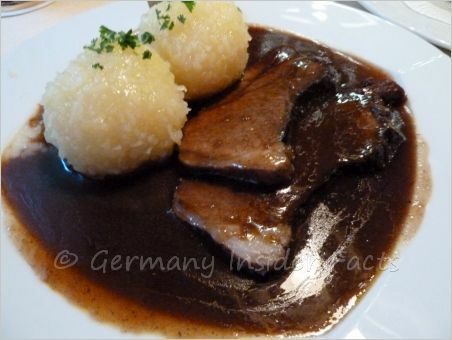 Pictured is a Sauerbraten with Lebkuchensauce I enjoyed thoroughly in Dinkelsbühl. You won't get disappointed when you look out for traditional German restaurants that serve local treats. 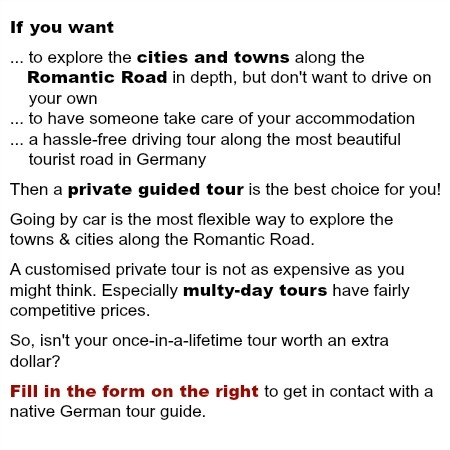 Whether you plan to travel the entire Romantic Road or you are going to visit your favourite towns, I will give you the tips and info you need for a great experience. Join me on a fantastic journey to the most stunning tourist attractions in Germany. I know you will love the Romantische Straße as much as I do. On this page you will find a short introduction to the major highlights along the Romantische Straße, info on how to get around, guided tours, and an informative map. 29 cities and towns are connected in the tourism consortium Romantische Straße. The most famous cities will get their own entry soon here on Germany facts. But first, here is the overview of main attractions along the Romantic Road from north to south. 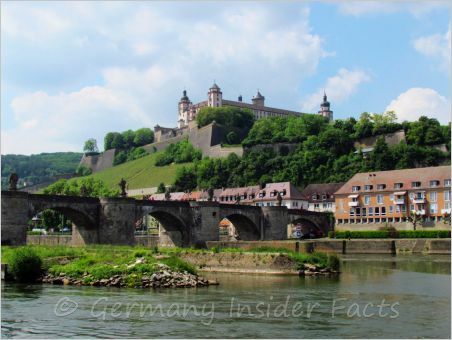 Würzburg - The Residence with the famous baroque staircase created by Balthasar Neumann, the prominent Fortress Marienberg, the old bridge over the Main river are the best known sights. But the thriving city Würzburg has much more to offer. Wertheim is the northernmost city in Baden-Württemberg, located at the confluence of the rivers Tauber and the Main. Bad Mergentheim - Spa town with a lovely market square and the historic Deutschordensschloss (castle of the Teutonic/German Order), a medieval castle built over several centuries. A must see is the famous painting "Stuppacher Madonna" by Matthias Grünewald in the church of Bad Mergentheim's suburb Stuppach. Weikersheim - The Renaissance Palace was home of the princes of Hohenlohe. The beautifully decorated Great Hall and other rooms can be visited. The palace has a lovely baroque garden with 100 statues and a orangery. Creglingen - See the well-known Marienaltar by Tilman Riemenschneider, located in the Herrgottskirche about 2 km outside of Creglingen. The wooden retable is said to be the most important piece of medieval wood carving. 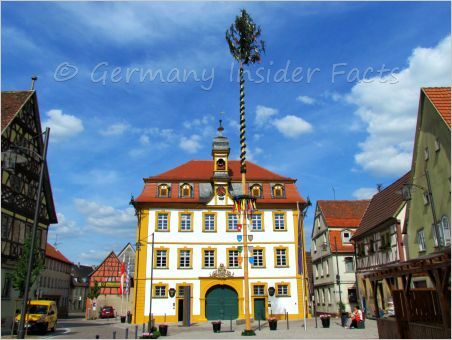 Röttingen - A beautiful town hall, old houses, remaining towers of the medieval town wall, and the sundial walk are the main attractions in this little town. Rothenburg ob der Tauber - Rothenburg is internationally known as the "jewel" amongst Germany's medieval towns. St. Jacob's church hosts another famous altar by Tilman Riemenschneider. Another favourite attraction is the Christmas museum and Käthe Wohlfahrt's Christmas shops. Here you can Christmas all around the year! Feuchtwangen - The picturesque market square is lined by beautiful old houses and the stunning town hall. The square is known as "Frankens Festsaal" (Frankonia's ball room) which refers to the restaurants available there. Dinkelsbühl - This is my favourite town on the Romantic Road. 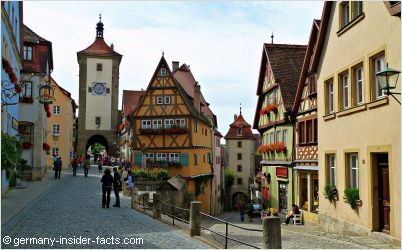 With its fortification walls and towers it is like Rothenburg's little sister. A beautiful place to stay and explore the central section of the Romantische Straße. Wallerstein - The Trinity Column, also known as Plaque Column is the most striking sight when you drive through the small town. Nördlingen - Located in the Nördlinger Ries (a huge meteorite crater that originates from 15 million years ago), this is another town with intact fortification walls. St. George's church with its large tower can be seen from far away in the flat landscape. 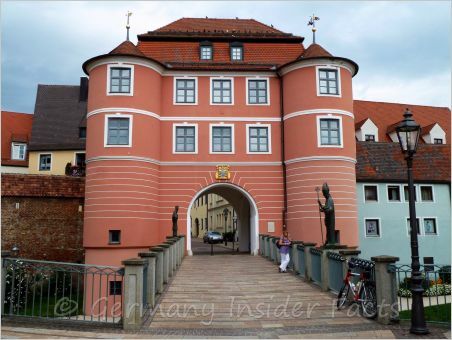 Harburg - An impressive castle overlooks the tiny town on the river Wörnitz. Donauwörth - Located where the Wörnitz flows into the Donau is this lovely town. The Reichenstraße is one of the loveliest streets in southern Germany. Augsburg - One of the wealthiest cities in the late middle ages, Augsburg is also one of the oldest cities in Germany. Hence, there is a lot of culture and history to explore in this city. 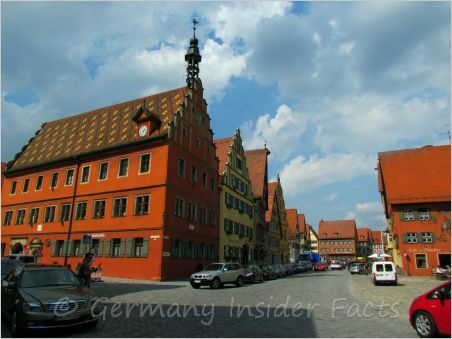 Friedberg - Another medieval town with remainders of the former fortifications and bastions. The Wittelsbacher Palace features an interesting display of watches. 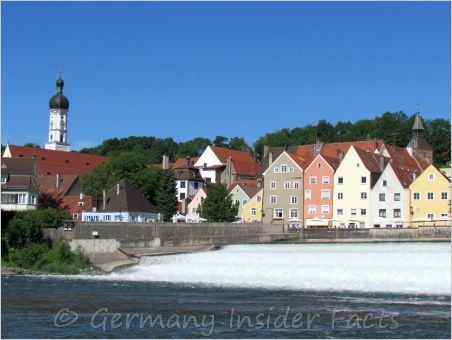 Landsberg am Lech - The historic old town and the lovely panorama along the river Lech are the main attractions. Wieskirche (Wies Church) & Steingaden - When you see the simple church in the meadows outside Steingaden, you don't expect the splendour the Wieskirche offers inside. The UNESCO world heritage site is the epitome of a Bavarian rococo church. Schwangau and Füssen - The Romantic Road ends in the romantic town of Füssen, and one of the most famous destinations is not far away - Neuschwanstein Castle. Each of these towns along the Romantic Road has its own atmosphere. It is like stepping back in time. Lovely hotels in picturesque historic houses invite travellers to stay for a while. Most hotels have restaurants to treat yourself with the best local food. Don't rush! Take your time to discover the marvellous attractions along Germany's most famous scenic route. 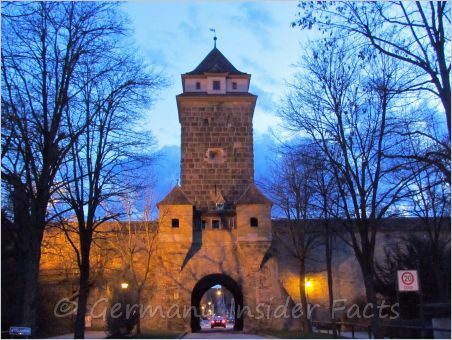 For more details about attractions along the Romantic Road click on a link below. I have picked a few guided tours, which visit the main attractions like Rothenburg and the royal castles. Some tours operate all around the year, while others only operate from March to October. There are day-tours from Frankfurt and Munich and one-way tours in both directions from both cities. Travel south from Frankfurt, along the Neckar valley and the Castle Road, to the medieval town of Rothenburg. Your guide tells about Rothenburg's history while you walk around the old town. Entrance fee to either the Kriminalmuseum (criminal museum) or St. Jakobs Church with the famous Riemenschneider Altar is included. The tour departs daily at 9:30am from a central location Frankfurt and returns after approximately 9 hours. 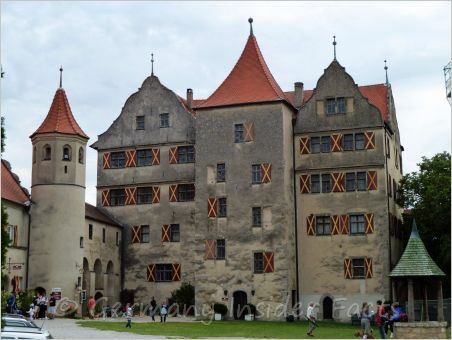 If you are short of time and really want to see Neuschwanstein Castle and Füssen on the southern end of the Romantic Road, this is the tour for you. It is a long day, but you will have plenty of time to explore Neuschwanstein Castle on a guided tour and on your own. Tour departs daily from Frankfurt at 8:30am and returns after approximately 14 hours. Travel from Frankfurt to Würzburg and then along the Romantic Road to Rothenburg, your first overnight stop. The 2nd day continues along the Romatische Straße with several stops before you book into your hotel in Hohenschwangau. Finally, on the 3rd day you will see the fantastic Neuschwanstein Castle. This is a package for independent travellers that provides coach transport, accommodation, transfers and sightseeing. This is another one-way tour from Frankfurt to Munich that lets you explore the Romantic Road by coach. Spend 24 hours at Rothenburg and enjoy the great sights. Experience a full Romantic Road day on this tour from Munich to the impressive Harburg Castle and Rothenburg. Departs daily from Munich at 8:30am, returns to Munich at approximately 7pm. See Neuschwanstein Castle on the first day, travel north along the Romantic Road to Rothenburg on the 2nd day. Enjoy this medieval town to the fullest for 24 hours before you arrive in Frankfurt on the 3rd day. 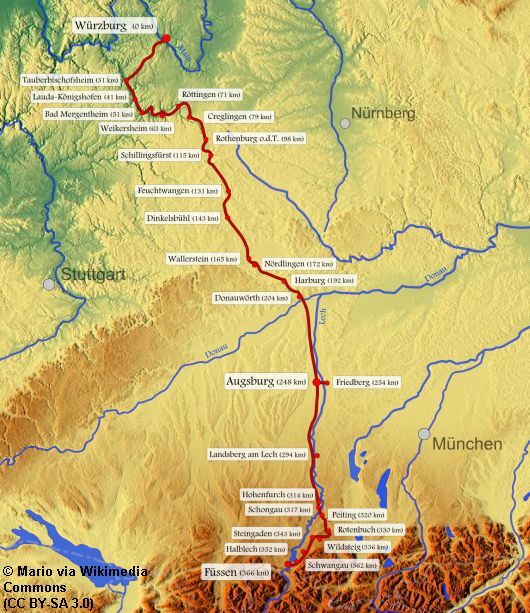 Here is a map with all cities and towns along the route, from Würzburg to Füssen. As the Romantic Road is a themed, or touristic route, it follows several national highways (Bundesstraßen) and small country towns. It is usually well signposted, you just need to follow the brown sign "Romantische Straße", or the direction to the next town. So the road itself is not the attraction but the cities and towns along the route. The best way to travel along the Romantic Road is by car or by coach. Unfortunately, there is no direct train schedule that connects all cities & towns along the route. If you don't want to drive yourself, here are the best options. Don't miss the guided tours which are especially convenient in winter time. The Europa Bus is a scheduled bus service that connects Frankfurt and Munich along the Romantische Straße. Every day from mid April to mid October a bus drives in each direction, departing at 8am in Füssen and Frankfurt. Individual packages with accommodation and several stops can be arranged. This bus service is a great way to take your time and enjoy your journey along one of the best tourist attractions in Germany. Würzburg and Augsburg are the two major cities along the Romantic Road which can be easily reached by ICE trains from Frankfurt and Munich. The northern towns like Bad Mergentheim and Tauberbischofsheim can be accessed by train from Würzburg, while southern destinations can be reached from Munich. Click on the DB logo to check the connections for the places you want to visit. Use the search box below to compare offers and find the best deal in one of those lovely historic hotels. 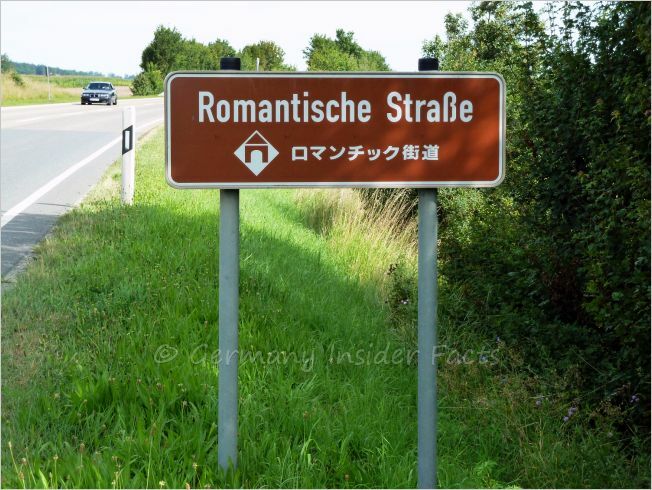 I hope you enjoyed the virtual journey along the Romantic Road. This scenic route deserves to be called one of the best tourist attractions in Germany. Don't hesitate, plan your visit today. Click the link below to read travel tips & add a comment.